If teens are being cyberbullied, they may exhibit the signs of traditional bullying. They may also avoid discussions about their online activities. 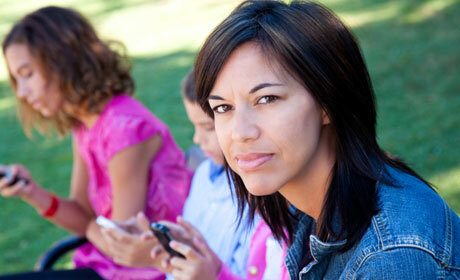 They may appear unhappy, irritable, or distressed, particularly after using the computer or viewing their cell phone. There may be a distinct change in how often they use the computer. Teens are often afraid to talk to parents about their cyberbullying experiences out of fear their online activities will be restricted. Reassure your teen you will not take away their phone or Internet, but if they encounter anything online that makes them feel uncomfortable, or if they receive any messages or view content that is harassing or upsetting that it is important to talk to an adult. Always be ready to listen to your teen and be their advocate. Cyberbullying can quickly escalate and requires swift adult intervention. Always keep a record of emails, chat room history, web postings or phone messages that you can take to your Internet Service Provider or the police. Always report incidents of cyber bullying to your child’s school and to your Internet Service provider. School boards have Codes of Conduct that include cyberbullying. If teens are cyberbullying others, they may have a history of aggression or bullying in more traditional ways, or have friends who do. They may also be more secretive about their online activities, switching screens or programs when others walk by. They may spend long hours online or become upset if they cannot use the computer. They may also use multiple online accounts and appear agitated or animated when online. There have been a number of stories in the media over the past few years concerning cyberbullying. Use these as a starting point for a conversation with your teen about what is considered acceptable behaviour both on and off-line. Set family guidelines and rules for online behaviour. Encourage teens to think how they would feel if they were the target of cyberbullying. Always keep your computer in a common area, like the kitchen, so you can monitor online activity and reactions to online communication. Always charge all cellphones in your room overnight. Always set up email, chat accounts and blogs with your children so you are aware of the type of information they are posting online. Keep a list of your teen’s IM and email contacts so you can verify each person. Always encourage your child to apologize to the person they have hurt. Emphasize the consequences if bullying does not stop – the effect it has on other people, the loss of all cellphone and Internet privileges, and possibly, legal consequences. Check out the Cyber Tool put together by Media Smarts, Canada's Center for Digital and Media Literacy. This valuable resource kit contains a self-directed tutorial that examines the moral dilemmas kids face in their online activities and offers strategies for helping youth deal with them; lesson plans for teachers of grades 5 and 6 that focus on search skills and critical thinking; and tip sheets for parents that provide useful ideas and strategies on how to teach your kids to be safe and ethical online. Dr. Pepler talks about cyberbullying. Technology advances quickly and it can be hard to keep up, but it is important for parents to familiarize themselves with the websites, blogs, chat rooms, email accounts, text abbreviations and IM programs their children use. If you need help, check out this parent tutorial. The Canadian Centre for Child Protection has launched www.thedoorthatsnotlocked.ca, a one-stop-shop where parents, educators and anyone else interested in keeping kids safe online can go to access Internet safety information. Get outside! Limit your teen¹s time online and foster off-line relationships. It reduces the risk of cyber bullying and provides a support network.